Tantrums are a part of a growing toddler’s life. Some toddler rarely burst into tantrums, others are more prone to them. A typical tantrum can last from a few minutes to a twenty-thirty minute episode and usually include lots of crying, screaming, kicking and throwing of things (including throwing themselves on the floor. This can especially be a problem when the tantrum is thrown outside the home). 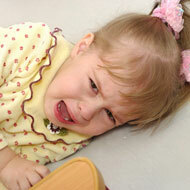 There are various reasons for why toddlers throw tantrums. In some cases it could be the source of extreme frustration and anguish arising from the inability to communicate needs effectively; a tantrum can be the result of fatigue or hunger – when toddlers don’t get . How To Deal With Toddler Tantrums? How Must I Discipline My Toddler? How To Handle Toddler Misbehavior? Are Toddlers Affected By Divorce?